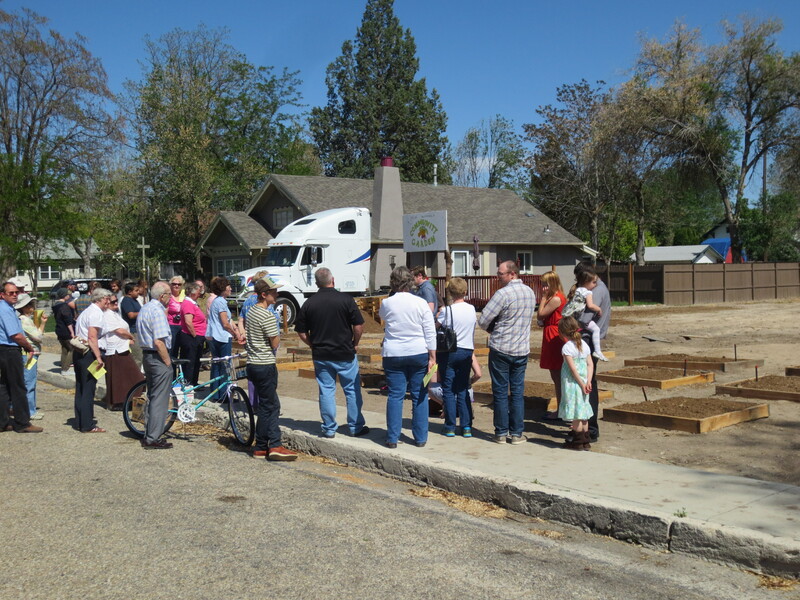 Last month a group of about 25 people drove around Nampa in buses and cars and blessed six community gardens. This outing began last winter, probably about the time our master gardeners were planting their seedlings. I finally got around to reading Nadia Bolz-Weber’s book Pastrix, in which she writes about ministry out in the city of Denver. I read an excerpt from Sara Miles’ new book City of God: Faith in the Streets in the Christian Century magazine. And on Ash Wednesday I read posts on facebook by a Methodist clergy friend taking ashes out into her neighborhood in Washington, D.C. and an Episcopalian clergy friend in suburban Chicago whose congregation celebrated a sort of Ashes on the Go (people could pull into the parking lot, participated in a brief liturgy, including the imposition of ashes). Surely Trinity could and should be out there. I also knew that we needed to initiate or enter into some kind of ecumenical ministry. We ELCA Lutherans highly value ecumenism but it’s not always clear how it should take on flesh. 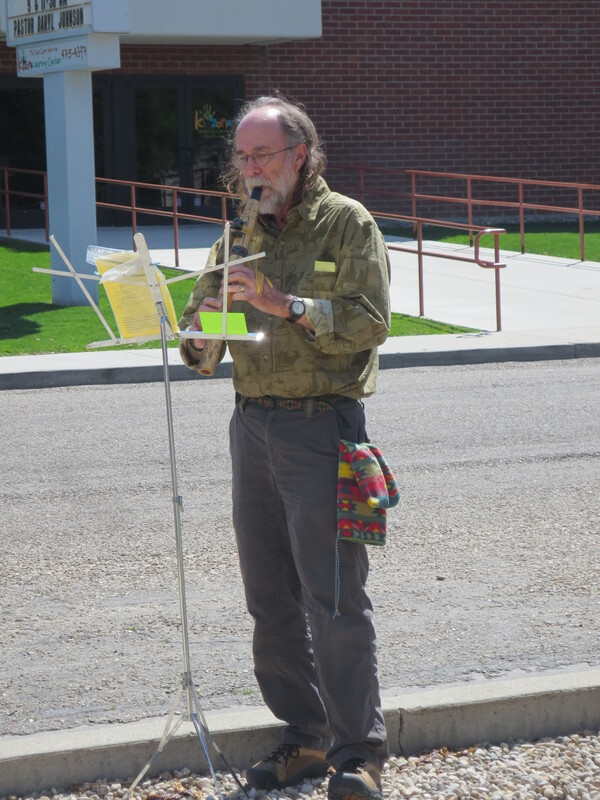 Trinity Lutheran Church is known, both inside our walls and in the the wider community, for our outreach (see previous posts about our garden, Mercy Housing, and CROP Walk), but not necessarily for worshiping out where everyone can see us. We celebrate the Easter Vigil at the Centennial (outdoor) Amphitheater at the College of Idaho but that’s under the cloak of darkness, hardly a public testimony. Our garden is already outside, so I thought perhaps we could start there. Horticulture blessings were familiar to me. For six springs as a pastor in rural Iowa my congregation celebrated Rogation Sunday. 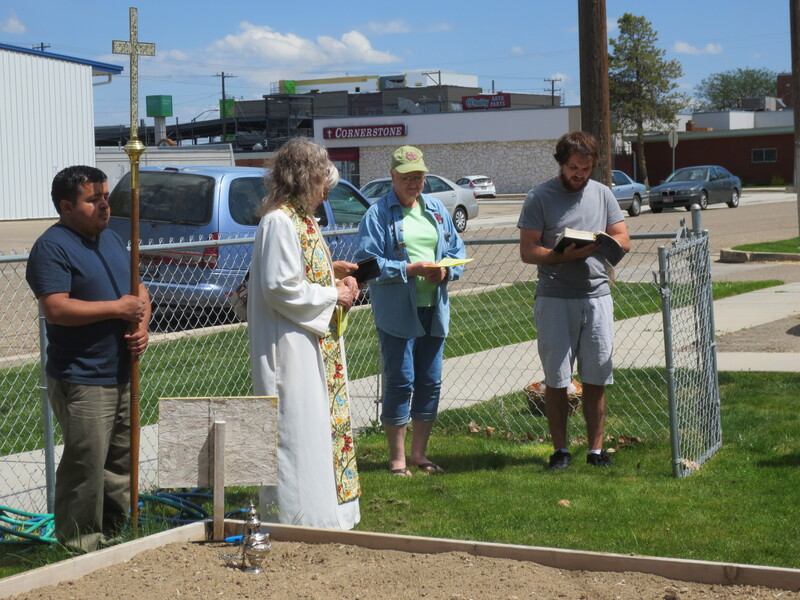 When I came to Idaho I simply adapted that litany to a garden blessing. 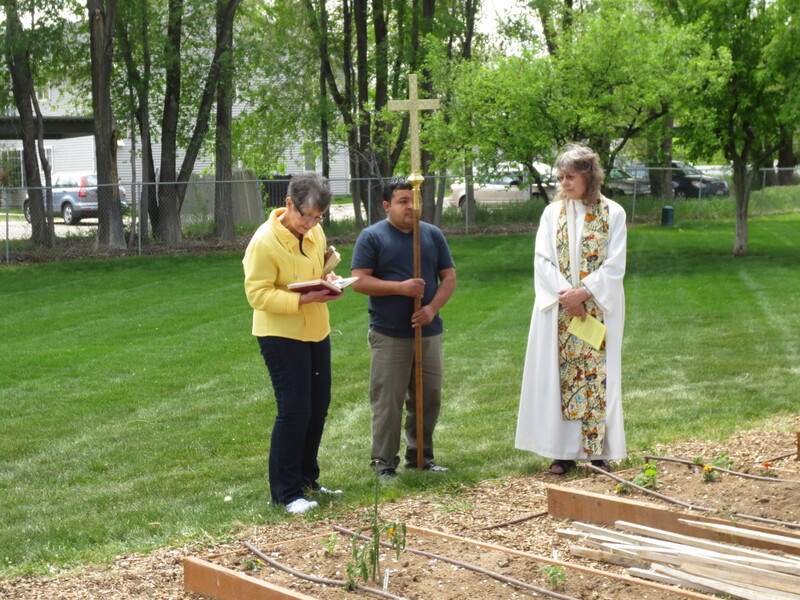 Every April we have ended a worship service by processing out to the garden for this short blessing–praying over the seeds, soil, and water. This had been adequate but I never made the effort to make it as important and festive as it deserved to be. What if we brought together a number of enthusiastic gardeners for a whole afternoon of blessings? Fortunately I have some fabulous colleagues in Nampa. 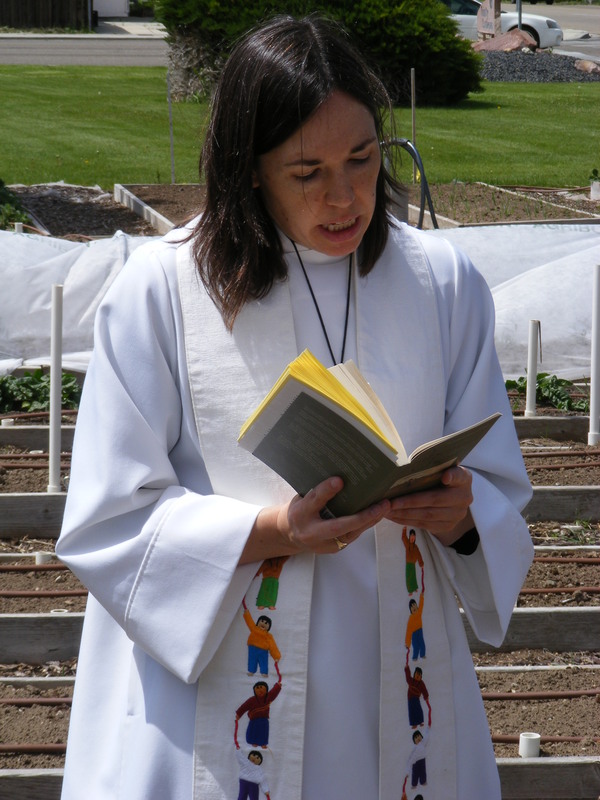 When I asked my Episcopalian friend, whose congregation also has a community garden, about my idea, she helped color it in: “I know the perfect song…Every congregations should choose a scripture passage and another reading for when we stop at their site…I’ll get our bus so we can all ride together,” and my favorite, “Do you want me to bring the Holy Water?” She is my high-church kindred spirit in Nampa. “Should I wear my alb?” I asked the week before the blessing, “Of course!” And she was right. Why wouldn’t I? One of my goals was to be the church in the world and to do that as a woman clergy person in Nampa, ID, I needed to dress the part (that’s a topic for another time). 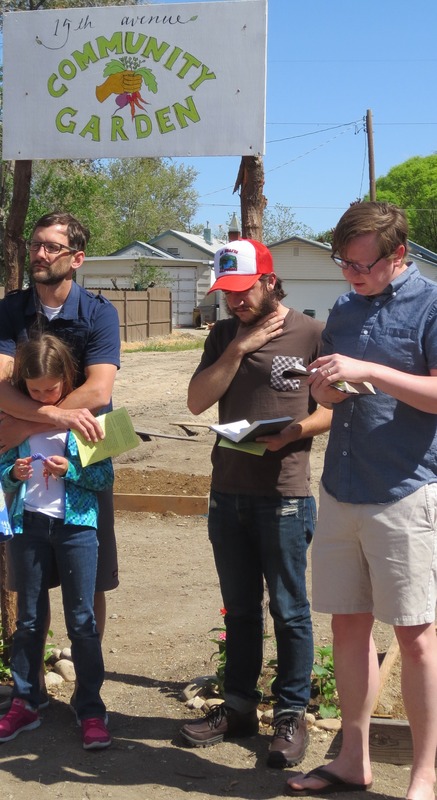 I had been in touch with another friend, a pastor at one of Nampa’s largest Nazarene congregations, earlier in the year because he was planting a community garden on church grounds to be run by the congregation’s neighbors. Another Nazarene congregation had been growing a community garden for a few years, starting under the guidance of Trinity’s master gardeners. These same master gardeners pointed me to the final garden. A woman from the Seventh-Day Adventist church had taken the “How to Garden the Trinity Community Garden Way” (also known as raised-bed gardening 101) and had been inspired to start a community garden on her church’s grounds.